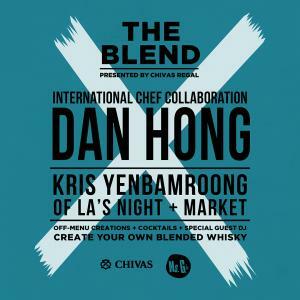 Get ready for culinary sparks to fly when Dan Hong and LA’s Kris Yenbamroong join forces in the kitchen for two nights only at Ms.G's as they whip up some innovative eats to pair with a selection of Chivas Regal cocktails. Introducing The Blend, presented by Chivas Regal – an exclusive series of international chef collabs, bespoke cocktails and whisky blending at Ms.G’s. Over two big nights, Merivale’s resident king of innovation Dan Hong will team up with straight-talking, game-changing LA chef Kris Yenbamroong of Night + Market fame. Renowned for his cult Thai cuisine, Yenbamroong will be visiting Australia for the first time this October. Together, the pair have come up with a generous party-style menu that brings together their two cooking styles, with delicious bites including Kris's famed Crispy rice salad and Sai Uah sausage bite w Nam prik Noom and Dan's Coconut sorbet with chivas whisky. Expect an immersive night of unexpected flavours, creative mixology, great music, and the art of blending whisky. Taking place over October 10th and 11th, this match up is the first in The Blend series and the first time Dan has invited a guest chef to join him at Ms G’s, so it’s one not to be missed. If there’s one thing Chivas Regal know; it’s the art of blending. So come along and experience the magic that happens with just the right combination of creative eats designed to bring out the flavour notes in a selection of whisky cocktails, custom whisky blends, and a special guest DJ who knows just how to get the party started. *Ticket includes all food, four Chivas Regal cocktails, a custom whisky blend experience, your very own blended whisky to keep and entertainment until late.